Ernest Walter Henry Tainton was the eldest of the five sons of Walter Henry Tainton, a farm labourer and cowman, and Clara Jane née Farmiloe. He was born in Horsley on 31 January 1895 but by 1901 the family had moved to Owlpen. In 1911 Ernest was a mill hand in a cloth factory and still living at home, which was then in Newington Bagpath. By the time war was declared the Taintons had settled in Frampton and Ernest was working as a labourer. Ernest volunteered early to join the Army, attesting on 11 November 1914. Details of the place of his attestation have not survived the partial destruction of his records, but the next day he was at the Bristol depot of the Gloucestershire Regiment, to be posted a few days later to the 9th (Service) Battalion as a private. He left Britain for France on 19 September 1915 (by which time his father Walter had been killed in action near Ypres), serving with Francis William Aldridge and William George Birch throughout the war, and also initially with Christopher Charles Fryer and Thomas Henry Griffin. The 9th Glosters did not remain in France long, being redeployed in November to the Mediterranean Expeditionary Force which landed at Salonika in Greece, and then moved north to strengthen Serbian resistance against Bulgarian forces. The battalion spent two and a half years in the Balkans, and would have taken part in the battles of Horseshoe Hill and Doiran. As the Austro-Hungarian and Bulgarian forces opposing them weakened, the 9th Glosters were withdrawn from Greece in July 1918 and moved to France, where they joined the 66th (2nd East Lancashire) Division which was being re-formed following losses in the early 1918 Somme campaign. They came into the field in October for the Battle of Cambrai, followed by the Pursuit to the Selle and the offensive against the Hindenburg Line. With only a week's rest before, as Divisional Pioneers, they bridged the Selle, they were again in action for some sharp engagements near Le Cateau in the final days of the war after which they were ordered to occupy the Rhine bridgeheads until February 1919. Ernest's service earned him the 1914-15 Star, British War Medal and Victory Medal and he is commemorated on the plaque in the village hall. After demobilisation in March 1919 and transfer to the Reserve, Ernest returned to Frampton to live at Ward's Court, marrying Lily Gertrude Twinning in 1922. Four children followed: Stanley, Ronald, Ilene and Gordon. Their home was later next to the garage (now Frampton Autos), and Ernest worked in engineering. At the beginning of 1960 Ernest lost his mother and wife within three days of each other; both were buried at St Mary's. 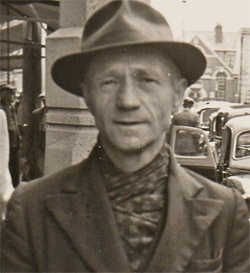 Ernest Walter Henry Tainton moved to 22 Phillimore Gardens to live with his son, Stanley, and was himself buried in the churchyard on 13 January 1979.